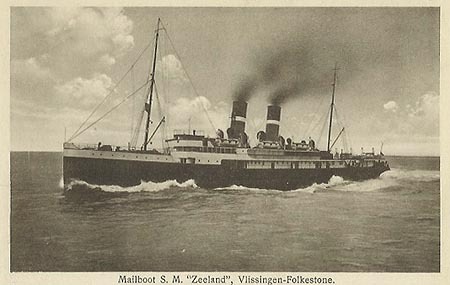 This page is one of a series devoted to postcards and photographs of Stoomvaart Maatschappij "Zeeland" (SMZ - the Zeeland SS Co). This page shows ships delivered between 1875-1938. Earlier ships are shown on SMZ Page 2: 1939-1989. An alphabetical list of ships on this page is shown below. The Table beneath gives links to complete history pages on selected individual ships. Below the table is a Fleet List in chronological order. Stoomvaart Maatschappij "Zeeland" ( SMZ - the Zeeland SS Co) was formed in 1875 to operate services from Vlissingen (Flushing) (Flushing), Zeeland, Netherlands to England. Over the years, seven different English ports have been used:- Sheerness, Queenborough, Dover, Port Victoria, Tilbury, Folkestone and Harwich. The Dutch port remained Vlissingen (Flushing) until after the Second World War, when it transferred to Hook of Holland. 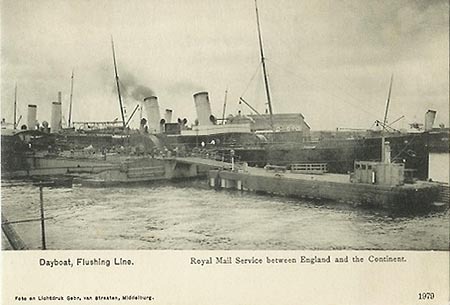 Services started with the ex-Confederate blockade runners Stad Middelburg and Stad Vlissingen on July 26th 1875 between Sheerness and Vlissingen (Flushing), since the pier at the intended UK port, Queenborough, had not been finished. Sheerness and Queenborough are close to each other on the eastern bank of the River Medway. 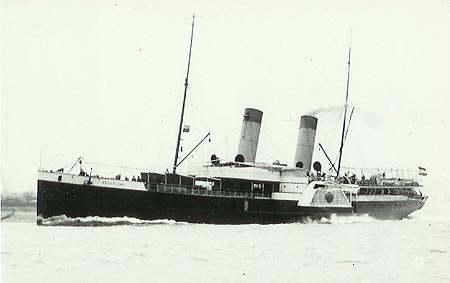 A third steamer, the ex-Snaefell (1) of the IOMSPCo was bought as a reserve ship, becoming the Stad Breda. Poor support led to the route ceasing in November 1875. The service restarted in May 1876, between Vlissingen (Flushing) and the newly completed pier at Queenborough, cargo traffic also being carried. Initially a daily overnight service (except Sundays) was offered. The Dutch Government awarded SMZ the mail contract to England. In first ships built for the route were the Prinses Marie and Prinses Elisabeth of 1878, built by John Elder of Glasgow. Similar steamers Prins Hendrik (1) and Willem Prins van Orange followed in 1880 and 1882. In 1882, Queenborough Pier was seriously damaged by fire, and the passenger service moved to Dover for four months. 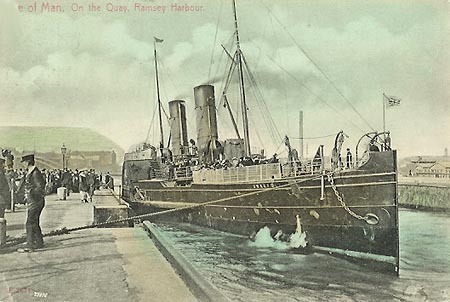 Cargo services to Queenborough did not restart until 1885, and cargo steamers were chartered to operate into London in the interim. In 1887, the service became twice-daily, with three new paddle steamers, the Duitschland, Engeland and Nederland being acquired. 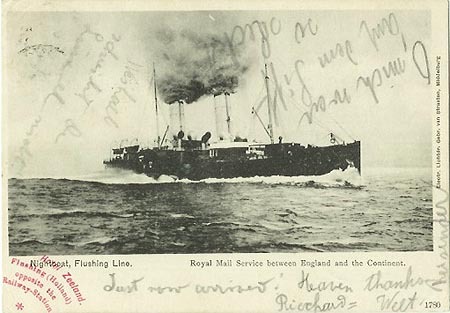 In 1893, the Great Eastern Railway services from Harwich were improved and the Zeeland suffered a decline in traffic. They ordered three new paddle steamers which were delivered in 1985, the last paddlers to be ordered for the route. They were named Koningin Wilhelmina (1), Koningin Regentes and Prins Hendrik (2). In 1897, a temporary transfer to Dover was made again, following damage to the railway to Queenborough. 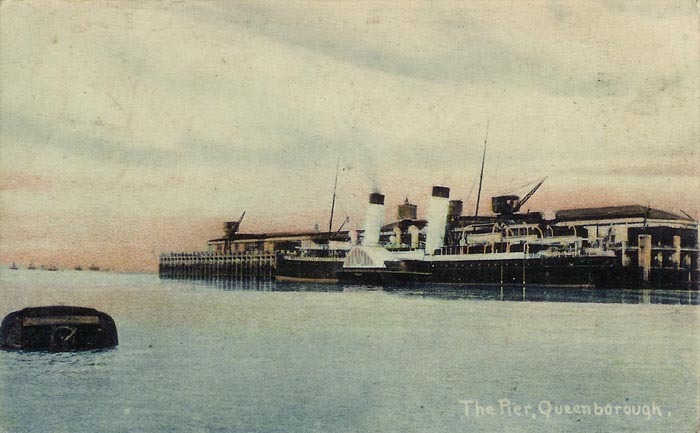 In 1900, Queenborough pier was destroyed by fire a second time, and the service moved temporarily to Port Victoria, on the opposite bank of the River Medway. Things then settled down for nine years until the Great Eastern Railway received their first turbines in 1903, and accelerated their services. SMZ responded by building three turbines of their own at Fairfields, the Prinses Juliana (1), Oranje Nassau and Mecklenberg (1). The turbines were used on the night service, with the less competitive day service being operated by the displaced paddle steamers. After one year, the turbines were moved to Folkestone in 1911, since the Medway was unsuitable for their greater draft than the paddlers. The distance from Vlissingen (Flushing) to Folkestone was 92 miles, compared to 112 miles from Queenborough. The day service remained at Queenborough. Prinses Juliana (1) and Mecklenberg (1) were lost within days of each other early in 1916, and replacements were built in 1920 and 1922, becoming the Prinses Juliana (2) and Mecklenberg (2). These were built in Holland using the original Fairfield drawings. SMZ services started with the Stad Middelburg and Stad Vlissingen on July 26th 1875 between Sheerness and Vlissingen (Flushing). They had been built in 1865 by Quiggin & Jack of Liverpool as the Southern and Northern, and had served as blockade runners in the American Civil War. They were acquired and renamed by SMZ in 1875. Stad Vlissingen stranded and lost in 1879, and her sister was renamed Aurora in 1881, followed by sale in 1889. A contemporary illustration of Stad Middelburg. SMZ services started with the ex-Confederate blockade runners Stad Middelburg and Stad Vlissingen on July 26th 1875 between Sheerness and Vlissingen (Flushing). 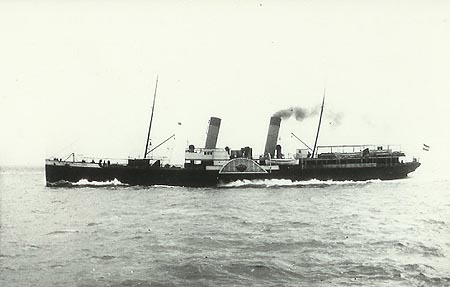 A third steamer, the ex-Snaefell (1) of the IOMSPCo was bought as a reserve ship, becoming the Stad Breda. Snaefell (1) was the first of a series of two-funnelled paddle steamers built by Caird's of Greenock. The postcard below shows the 1976-built Snaefell (2), which replaced Snaefell (1). She was also built by Caird, and is similar to, but larger, than her predecessor. Stendel postcard of Snaefell (2) at Ramsey. 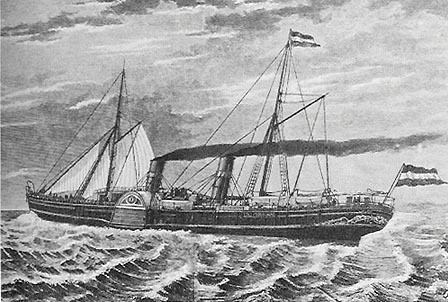 SMZ was refinanced in 1878, allowing the purchase of two purpose-built paddle steamers, Prinses Marie and Prinses Elisabeth, by John Elder of Glasgow predecessors of Fairfields. They largely replaced the original three steamers except for relief work. Two-cylinder compound diagonal engines, with a low pressure cylinder diameter of 106 inches, drove them at just over 16 knots. they were sold in 1898 to German and Swedish owners, being renamed Germania and Svea. In 1896, Prinses Marie had been chartered by Albert Ballin (HAPAG) for services to Helgoland. 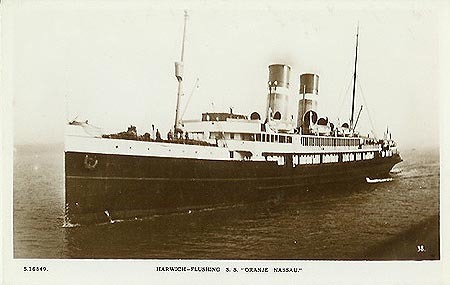 She was renamed Prinzess Marie and received a white hull. Some references suggest that Prinses Elisabeth took a similar charter as Prinzess Elisabeth. In 1880, the very similar steamer Prins Hendrik (1) was delivered by John Elder, to cope with additional traffic created when through train services started from Vlissingen (Flushing) to Berlin. She was followed in 1882 by the Willem Prins van Orange. She was also very close in design to her John Elder predecessors, but had taller funnels and was capable of 18 knots. 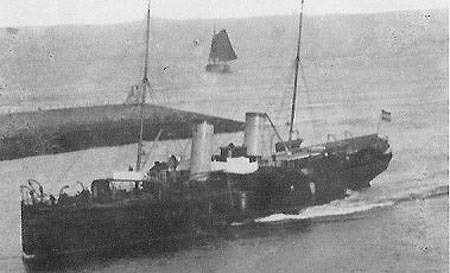 The latter pair were sold in 1902 and 1909, but along with many ships in the SMZ fleet, had been kept in reserve for many years. Prins Hendrik (1) survived for seven years without being renamed after the delivery of Prins Hendrik (2). Photograph of Prinses Marie or Prinses Elisabeth. Photograph of Willem Prins van Orange. In 1887, the service became twice-daily, with three new paddle steamers, the Duitschland, Engeland and Nederland being acquired. They were built by Fairfields (previously Elders) and were used on the new day service between Vlissingen (Flushing) and Queenborough. 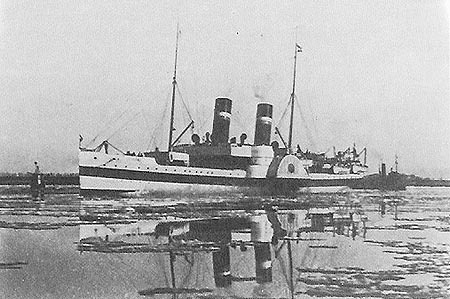 Engeland and Nederland were indirectly replaced by new turbines in 1910, and were sold for scrap (the new turbines were night boats, but displaced the 1895 paddle steamers onto the day service). Holland was neutral in the First War, and Duitschland, was renamed Zeeland in 1916. She was used as a hospital ship and continued in this service after the war repatriating POWs from Boston (Lincs) to Rotterdam. 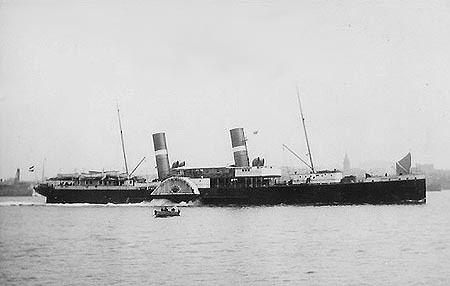 She was scrapped in 1922. 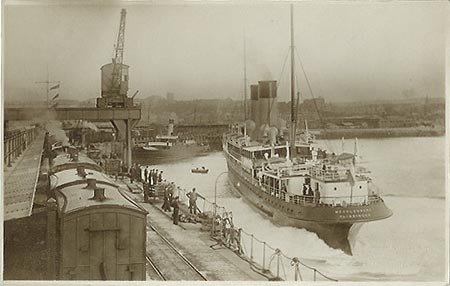 Postcard of the Dayboat Nederland and two other paddle steamers at Vlissingen (Flushing). Postcard of the Dayboat Nederland, posted from Vlissingen (Flushing) in 1904. 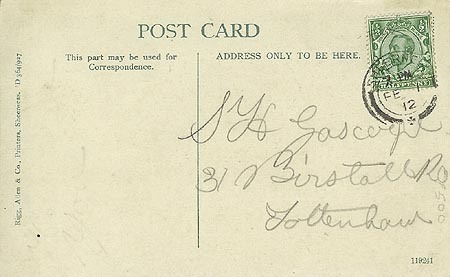 Postcard of one of the Dayboats, posted from Middelburg in 1907. 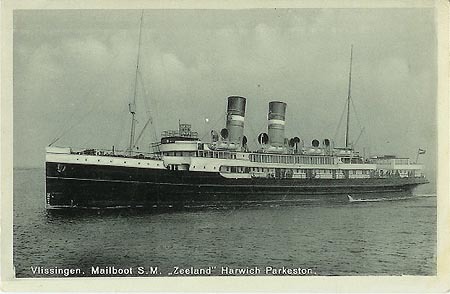 Postcard of the Dayboat Nederland, with broader black funnel tops. 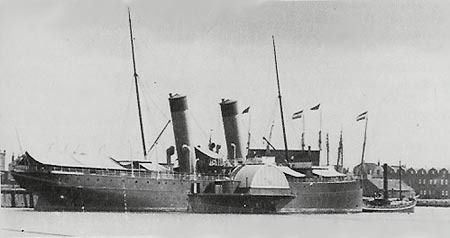 Photograph of Nederland, with later broad black funnel tops. 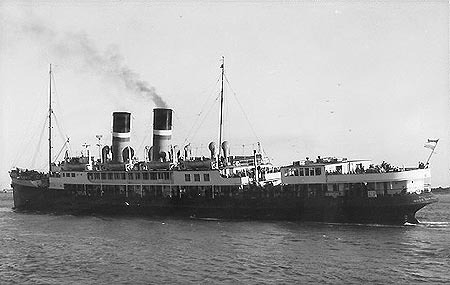 Photograph of Engeland, with broad black funnel tops. 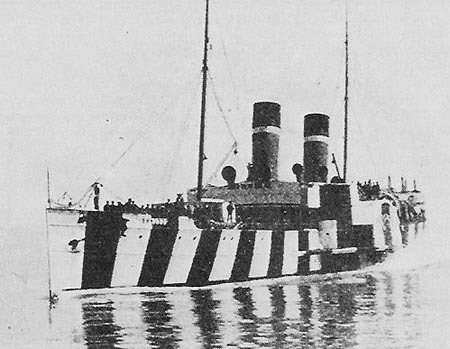 Photograph of Zeeland, in use as a hospital ship, in dazzle camouflage. 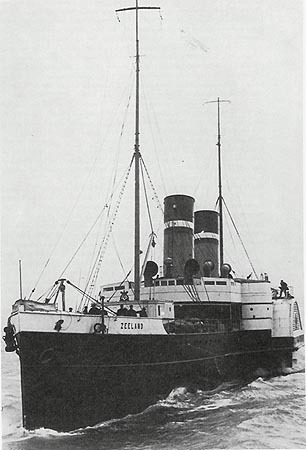 Photograph of Zeeland, in use as a hospital ship. In 1893, the Great Eastern Railway services from Harwich were improved and the Zeeland suffered a decline in traffic. They ordered three new paddle steamers which were delivered in 1985, the last paddlers to be ordered for the route. They were named Koningin Wilhelmina (1), Koningin Regentes and Prins Hendrik (2). In 1897, a temporary transfer to Dover was made again, following damage to the railway to Queenborough. In 1900, Queenborough pier was destroyed by fire a second time, and the service moved temporarily to Port Victoria, on the opposite bank of the River Medway. Things then settled down for nine years until the Great Eastern Railway received their first turbines in 1903, and accelerated their services. SMZ responded by building three turbines of their own at Fairfields, the Prinses Juliana (1), Oranje Nassau and Mecklenberg (1). 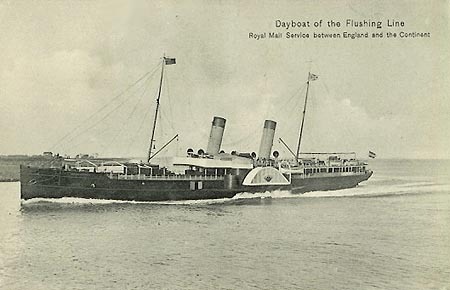 The turbines were used on the night service, with the less competitive day service being operated by the displaced 1895 paddle steamers, which were modified for their new role. 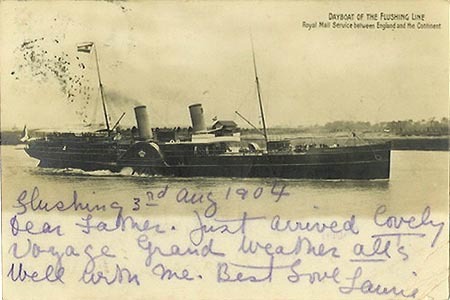 Rare postcard of an SMZ paddle steamer at Queenborough Pier. 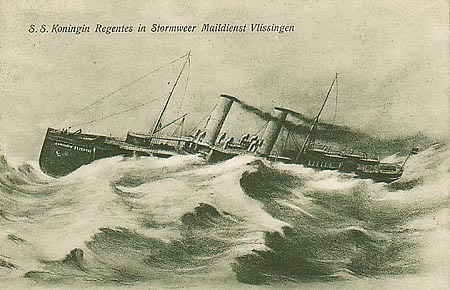 Art postcard of Koningin Regentes in a storm. 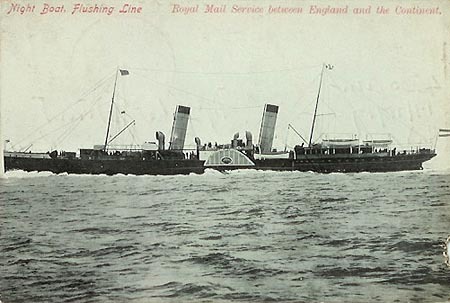 Pre-war postcard of one of the Night Boats, with narrow black funnel tops. Card overprinted with an advert for the Zeeland Hotel, Flushing. Pre-war postcard of the Night Boat Koningin Regentes, with broader black funnel tops. Posted from Vlissingen (Flushing) in 1907. 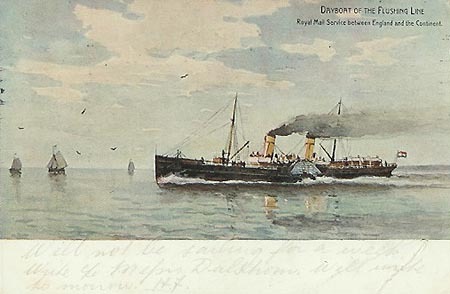 Pre-war postcard of one of the 1895 paddle steamers, as modified for use as a Dayboat. Post-war photograph of Prins Hendrik (2), with red, white & blue funnel bands. The Great Eastern Railway received their first turbines in 1903, and accelerated their services. SMZ responded by building three turbines of their own at Fairfields, the Prinses Juliana (1), Oranje Nassau and Mecklenberg (1). The turbines were used on the night service, with the less competitive day service being operated by the displaced 1895 paddle steamers. After one year, the turbines were moved to Folkestone in 1911, since the Medway was unsuitable for their greater draft than the paddlers. The distance from Vlissingen (Flushing) to Folkestone was 92 miles, compared to 112 miles from Queenborough. The day service remained at Queenborough. Prinses Juliana (1) and Mecklenberg (1) were lost within days of each other early in 1916, and replacements were built in 1920 and 1922, becoming the Prinses Juliana (2) and Mecklenberg (2). These were built in Holland using the original Fairfield drawings. 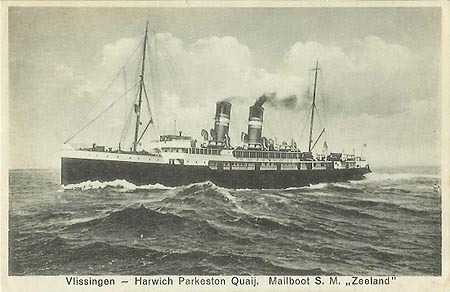 Oranje Nassau also survived the Second War, and re-opened services from Harwich to Holland in 1946 with the Prague of the LNER. The following year she moved to the day service. 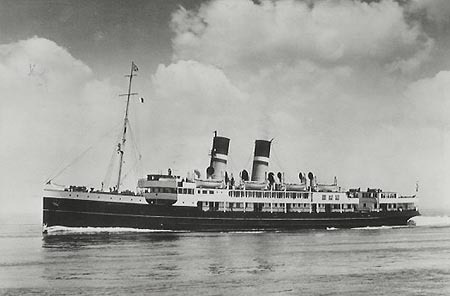 When the 1939 diesels returned to service in 1948, Mecklenberg (2) was chartered to Batavier Line for their Rotterdam-Tilbury service. This continued until 1952, when she returned to the Harwich-Hook route. She was scrapped in 1954. 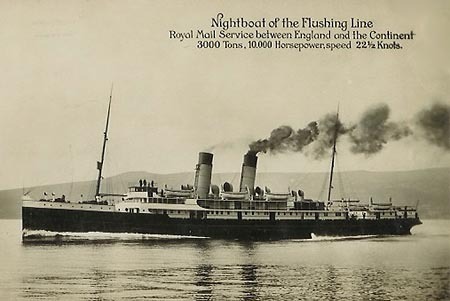 Postcard of one of the 1909 Night Boats. Halksworth Wheeler (Folkestone) postcard of Mecklenberg (1) at Folkestone. 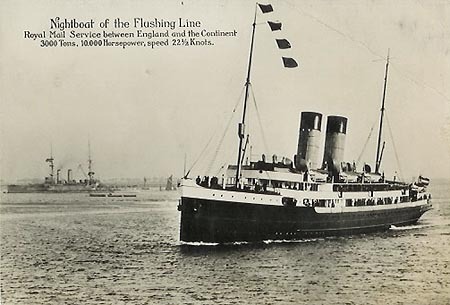 Kingsway (W.H.Smith) postcard S.16849 of Oranje Nassau on Harwich-Flushing (Vlissingen) service. Duncan photographic postcard of Oranje Nassau. She survived both wars in a career of 43 years. Two of the 1909 turbines, Prinses Juliana (1) and Mecklenberg (1), were lost within days of each other early in 1916, and replacements were built in 1920 and 1922, becoming the Prinses Juliana (2) and Mecklenberg (2). These were built in Holland using the original Fairfield drawings. Prinses Juliana (2) joined Oranje Nassau on the Vlissingen (Flushing)-Folkestone night service. Mecklenberg (2) inaugurated a new Vlissingen (Flushing)-Folkestone day service. 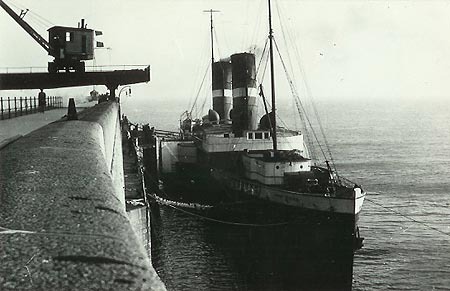 In January 1927, both ships transferred to Harwich. Their boat decks were extended and the promenade decks were glazed. 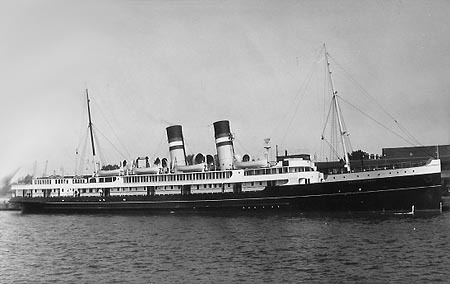 Prinses Juliana (2) was lost in World War 2, when she was bombed in May 1940 whilst taking troops from Vlissingen to Ijmuiden. Mecklenberg (2) escaped to the UK and was used as an accommodation ship and assault landing ship for the Normandy invasion. She survived the Second War, and re-entered day services from Harwich to Holland in 1947. When the 1939 diesels returned to service in 1948, Mecklenberg (2) introduced a new twice-weekly summer day service between Vlissingen (Flushing) and Folkestone in July 1949. 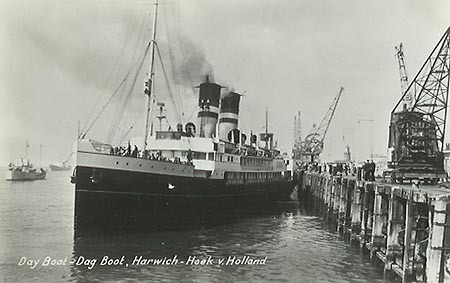 This service survived until September 1952, since when all subsequent services have run between Harwich and the Hook of Holland. 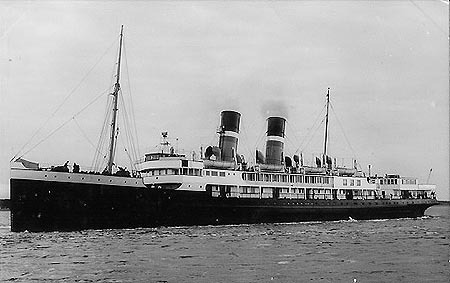 She was maintained as reserve ship until sold for scrap in 1960 on the arrival of the Koningin Wilhelmina (2). Kingsway (W.H.Smith) postcard S.19910 of Prinses Juliana (2) on Harwich-Flushing (Vlissingen) service. 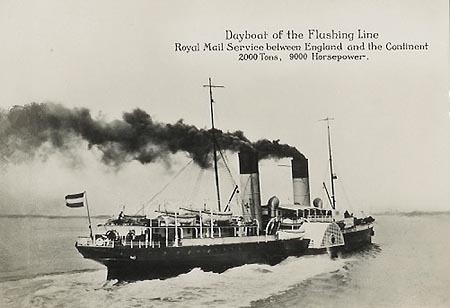 Postcard of Prinses Juliana (2) on Folkestone-Flushing (Vlissingen) service. 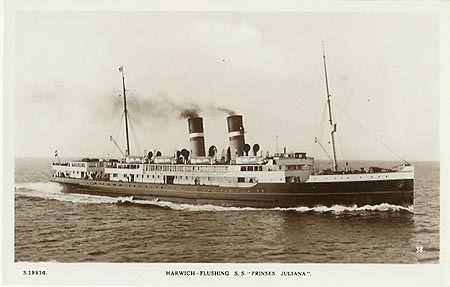 Postcard of Prinses Juliana (2) on Harwich-Flushing (Vlissingen) service. Official SMZ postcard of Mecklenberg (2). Harwich-Hook day service - daily including Sundays. Printed by J.G. van Agtmaal, Hilversum. AKO (Amsterdam) postcard of Mecklenberg (2) at Hook of Holland. Photographic postcard of Mecklenberg (2).